Periodontal disease is usually a consequence of different inflammatory conditions affecting the periodontium. The common types of these diseases are gingivitis and periodontitis. Periodontitis was resulted mainly to untreated gingivitis, Chronic periodontitis may occur as a localized disease in which less than 30% of examined periodontal sites demonstrate clinical attachment and bone loss. Moreover, it may occur as a more generalized disease with more than 30% of sites was affected. The severity of chronic periodontitis can be classified as a mild: 1 - 2 mm, moderate: 3 - 4 mm and severe ≥ 5 mm based on the measure of clinical attachment loss. However, the mild-to-moderate periodontitis is the most common, with prevalence ranging from 13% to 57%, depending on the sample characteristics and the case description. Additionally, the extent and severity of periodontitis increased with age. The prevalence of periodontitis has been reported by the World Health Organization (WHO), which showed a prevalence of severe periodontitis in about 8 - 10% population[4,5]. The first published research work on the prevalence of periodontitis from an Arab country was an Egyptian study. It reported that prevalence was classified as mild, medium and severe periodontitis to be 27.6%, 25.2% and 45%, respectively. An Australian study on periodontal disease in Australian adult individuals, the results revealed that the prevalence of periodontitis was 22.5% and strongly correlated to age, with the youngest age subjects having markedly lower prevalence (7.4%) than the older age patients. Study on prevalence and severity of periodontal diseases among Nepalese adults. This study reported that 52.5% gingivitis and 47.5% periodontitis. In addition, 28.3% localized and 18% generalized form of periodontitis. There was no statistically significant difference in the gender when the prevalence of periodontal disease was compared. Moreover, 51.4% of male and 44.4% of female was seen to be affected with periodontitis. According to our knowledge, there are a few studies on severity of periodontal diseases in Saudi Arabia. The prevalence of periodontal disease was reported among 2739 patients at dental clinics of King Khalid University, Abha, Saudi Arabia. They reported that gingivitis were found in 1722 (63.2%), mild gingivitis was 49.8%, moderate gingivitis 45.8%, severe gingivitis 1.97%, acute gingivitis 0.52% and puberty gingivitis 1.80%. Total number of patients affected with various forms of periodontitis was 1009 (36.8%), in which mild periodontitis was 57.4%, moderate periodontitis 36.6%, severe periodontitis 4.95% and aggressive periodontitis 0.89%. The prevalence and severity of gingivitis was found increased with age to a peak in the 21 - 30 years age group, whereas, periodontitis highly significant in subjects above the age of 40 years. Abdel fattah AH et al., 2015; performed a study on the severity and bidirectional link between periodontal disease and type 2 diabetes mellitus in Saudi patients. The results of their research work revealed that a significant increase in PI and CAL were observed in patients and this increase progressed towards the various levels of periodontitis. In addition, the difference in PI scores between gingivitis, mild and severe periodontitis is not significant as compared to the difference in the PI scores of moderate chronic periodontitis. A study on periodontal conditions in smokers versus non-smokers was done by. They concluded that, the clinical periodontal parameters may be different in smokers versus to non-smokers and that masking of some periodontal signs can be an outcome of nicotine vasoconstrictor effect. Recently, research work on prevalence and severity of plaque-induced gingivitis in Saudi adult population. The study reported the prevalence of gingivitis was 100% among adult subject aged between 18 - 40 years old. 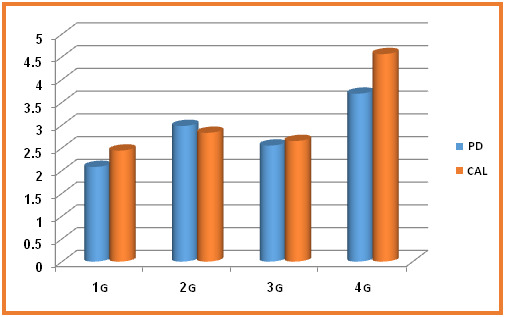 Moreover, the mean gingival index was 1.68 ± 0.31, which indicated a moderate gingivitis. More severe signs of gingival inflammation in males compared with females. Interestingly, the age was not related either to the gingival inflammation or to the amount of plaque accumulation. Nevertheless, males were more affected than females. In conclusion plaque accumulation is strongly associated with high prevalence of moderate to severe gingivitis among Saudi subjects. The present study was focused on the periodontal status on the population of Makkah city by assessment of periodontal parameters: PI, BI, PD and CAL. Moreover, the severity of periodontitis was assessed between the systemically healthy chronic periodontists patients in relation to presence of diabetes and smoking which considered as two major risk factors of periodontitis. Two hundred and fifty-four adult male chronic periodontitis were selected for the current study ranged between 24 - 60 years old with mean age of 37.50 ± 0.13 years. The patients examined from enrolled individuals at screening unit in three dental centers: Umm Alqura Dental Teaching Hospital, King Abdulaziz Hospital, and Al-Noor Specialty Hospital. The selection of patients was based on exclusion and inclusion criteria, in addition to panoramic radiographic examinations that demonstrate various degrees of alveolar bone resorption; mild, moderate, and severe (Figure 1, 2). Figure 1: Illustrates a chronic periodontitis patient. 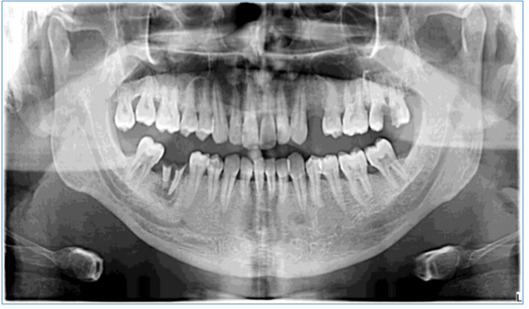 Figure 2: Showing panoramic view that represents a generalized mild to moderate alveolar bone loss. The consent form was obtained from all individuals and the periodontal examination procedures were explained before starting of the study. Inclusion criteria: 1- Adult periodontitis patients, 2- Diabetic patients for not less than 5 years, 3- Smoker’s patients smoke at least 20 cigarettes /day. Exclusion criteria: 1- Pediatric patients, 2- Immunocompromised patients, 3- Severe medically compromised patients, and 4- Pregnant women. Grouping: The selected chronic periodontitis patients were based on two major risk factors in presence or absence of smoking and diabetes mellitus. Periodontal Examination: The periodontal status of the patients evaluated by using of the following clinical parameters: plaque index (PI), bleeding index (BI), Probing pocket depth (PD) and Clinical attachments loss (CAL). A- Descriptive data include; mean ± standard deviation, medium, minimum and maximum. B- Un-Paired T-test: to compare the mean values of collective data.C- The values of significance at P ≤ 0.05.D- The statistical data were tabulated and graphed by using Microsoft-word 2010. The study included 254 adult male chronic periodontitis patients were categorized into the following four groups: G1 (Nondiabetic nonsmokers), G2 (Diabetic nonsmokers), G3 (No diabetic smokers )and G4 (Diabetic smokers). All patients were carried out to evaluation of periodontal clinical parameters: PI, BI, PD and CAL to assess the periodontal condition and severity of periodontitis in all examined groups. Figure 3: Illustrate the plaque and bleeding index in all studied groups. G1 (Nondiabetic nonsmokers), G2 (Diabetic nonsmokers), G3 (Nondiabetic smokers) and G 4 (Diabetic smokers), PI (Plaque index), BI (Bleeding index). Table 1: Demonstrate the statistical comparisons in plaque and bleeding index in studied groups. G1 (Nondiabetic nonsmokers), G2 (Diabetic nonsmokers), G3 (Nondiabetic smokers) and G 4 (Diabetic smokers) * Significant ** Highly significant. Table 1: Showed the statistical comparisons of PD depth and CAL in all examined groups. Figure 5: illustrate the severity of periodontitis in all groups. 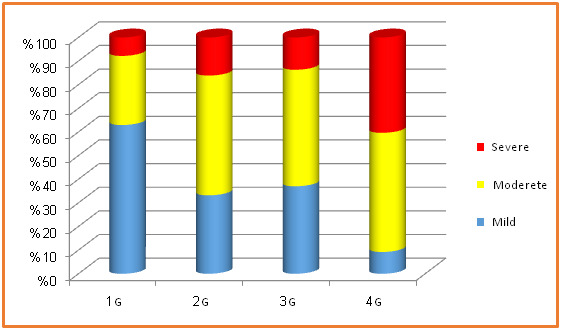 Table 3: Show the ratio of the severity of chronic periodontitis of general population and in all groups. 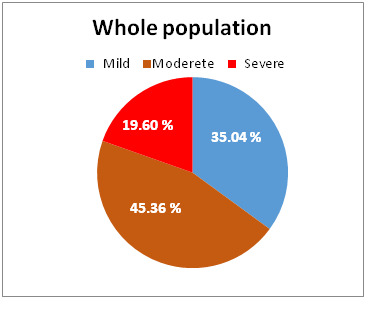 Figure 6: Showed the severity percentage of periodontitis in whole patients. The present study was conducted to evaluate the severity of periodontal condition in chronic periodontitis patients based on presence or absence of two major risk factors: smoking and diabetes mellitus on Saudi chronic periodontitis patients enrolled in multi dental centers in Holy Makkah city. Diabetes mellitus (DM) is considered one of the greatest effecting health problems in the recent decades and one of the most distributed diseases in the population. It represents a major risk factor for periodontal diseases that may lead to progression of alveolar bone resorption and gingival inflammation. The effect of DM in periodontium by formation of advanced glycosylation end products are a critical bonds in many complication of diabetes and their harmful effect which appears in the periodontal tissues. The epidemiological studies between DM and periodontal diseases are interesting and have broadly reviewed. Smoking represents major environmental local risk factors on periodontal tissues. Recent studies have confirmed a greater prevalence of attachment loss, recession, severe destructive periodontal disease, and less favorable response to nonsurgical or surgical periodontal treatment in smokers, as compared to nonsmokers[20-22]. Additionally, it seems difficult to distinguish the effect caused by tobacco from that provoked by bacterial infection. Clinical and epidemiological studies also reported that most refractory periodontal condition cases occur in smokers and that there is a dose- dependent relation, in which, the greater the quantity of cigarettes smoked a day and the duration of the smoking habit, the greater the periodontal bone loss. In the current study the results of plaque index were highly significant in non-smokers diabetic chronic periodontitis patients in comparison to non-diabetics nonsmokers. This result revealed that the effect of diabetes on bacterial changes of plaque bacteria that may increase plaque accumulation in diabetics more than non-diabetics. This result was in agreement with studies[14,24]. The results of current study showed that significant difference of plaque index in non-smokers diabetic chronic periodontitis patients versus non-diabetic chronic periodontitis patient. This result supported by studies[8,10,24]. Moreover, there is an extremely significant difference in smokers diabetics against smokers non diabetics. This finding is parallel with results of other studies[11,16]. For explanation, the presence of diabetes and smoking represent a highly risk factors in progression of gingival inflammation and bleeding rather than smoking only. Bleeding index is considered as a major indicator for the gingival inflammation. Furthermore, the bleeding index is decreased in smoker’s non-diabetics but there is no significant difference in relation to other groups except diabetics smokers. This finding is agreement with numerous studies[11,25-28]. On the other hand, BI is significant in diabetics than systemically healthy periodontitis patients; also, BI was highly significant increased in diabetic’s smokers versus other individuals. These results in consent with several investigations[19,24,29,30]. Probing pocket depth is considered a indicator for progression of periodontal inflammation rather than the severity of periodontitis[12,22-25]. Our results showed that significant difference of mean values of pocket depth in non-smokers diabetics in comparison to nonsmoker’s non-diabetics, and a highly significant increased in diabetic’s smokers. This result indicated that the combined effect of smoking and diabetes was worsening the inflamed periodontal status. This finding is matching with some studies[23,26,30]. Clinical attachment loss (CAL) revealed the severity of periodontitis rather than pocket depth[22,23,25,30]. The present study showed highly significant differences of CAL in diabetic smokers compared with either all groups. This result is supported with several studies[22,29,30,32]. The severity degree of chronic periodontitis varies among examined groups. In non-smokers non-diabetics, the majority of individuals represent mild periodontitis (60.72%), while the ratio of severe periodontitis is (8.27%). In addition, the moderate periodontitis ratio is higher in smokers than non-smokers. This represent that the shifting of periodontal status to the severity in smokers is more prominent than non-smokers. This finding is supported by some authors[12,31]. Regarding to the degree of severity for all groups, the obtained statistical data represent a high ratio of moderate periodontitis (45.36 %), whereas the ratio of severe periodontitis was (19.60 %). This finding shows that the severity of periodontitis is increased among population as in contrary with Torrungruang et al., (2005) they concluded that severe periodontitis ratio is up to 15% of the individuals. Soory M (2007) who conducted a study on periodontal disease and systemic disease prevalent in Caribbean catchment area of patients, and reported that 22 % presented with moderate periodontal disease and 68 % of patients examined with severe periodontal disease. This finding is differing than our results that represent the percentage of severe periodontitis of our study in whole individuals (19.60 %) and the moderate percent was (45.36 %). The results of the present study show that the severity of periodontitis is increased with diabetic smokers which were supported by Thomson et al., in 2014 concluded that a high proportion of severe periodontitis (11.9 %) is related to diabetic smokers. However, the ratio of severe periodontitis in this study was higher than that conducted by Thomson et al., in 2014.This contrary may be referred to; the present study is basing on selection of patients according to presence of smoking and diabetes. According to our knowledge, this study may be considered the first research work on evaluation of the periodontal conditions and severity of chronic periodontitis in Holy Makkah city. The current study represents a high proportion of clinical periodontal parameters in parallelism with an available research studies in Saudi Arabia. In fact, there is a limitation faced us in performance of this study include: small patient samples, three dental centers only involved in this study. So that, we suggest broad survey study include all dental centers in the Holy Makkah city and other region in Saudi Arabia to establish an accurate status of prevalence and severity of periodontitis in the whole Kingdom. This current study concludes the following: 1- The clinical periodontal parameters represent poor conditions of periodontal health within the population. 2- The presence of smoking and diabetes mellitus exaggerate the severity of periodontitis. 3- Further broad survey study is needed to clarify the percentage of prevalence, incidence and severity of periodontitis in the community of Saudi Arabia. Our study recommended that: 1- The awareness of oral hygiene measures and preventive modalities must be increased within Saudi Arabia populations. 2- Increasing the knowledge of dental practitioners and oral public health clinicians on importance the prevention of the local and controlling the systematic risk factors to avoid dental and periodontal complications, moreover encourage the patients how to reach to the best levels for oral health measures. 3- Raising the level and quality of dental and periodontal healthcare. 1. Petersen, P.E., Bourgeois, D., Ogawa, H., et al. The global burden of oral diseases and risks to oral health. (2005) Bull World Health Organ 83(9): 661-669. 2. Eke, P.I., Dye, B.A., Eei, L., et al: Prevelance of periodontitis in adults in the United States: 2009 and 2010. (2012) J Dent Res 91: 914-920. 3. Al-Harthi, L.S., Cullinan, M., Leichter J.W., et al. Periodontitis among adult populations in the Arab World. (2013) International Dental Journal 63: 7–11. 4. Assery, M., Awartani, F.A. 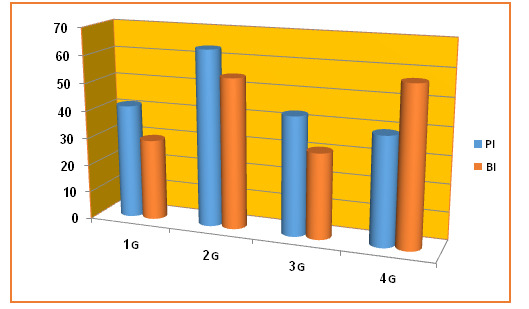 Level of periodontal health knowledge among high school students in the east of Saudi Arabia. (1998) The Saudi Dent J 10 (3): 116-122. 5. Al-Khateeb, T.L., Al-Amoudi, N.H., Fatani, H.H., et al. Periodontal diseases and caries experience of Diabetic patients in an Arabian community. (1990) The Saudi Dent J 2(3): 91-95. 6. Dawson, C.E. Dental defects and periodontal disease in Egypt, 1946–1947. (1948) J Dent Res 27: 512–523. 7. Periodontal diseases in the Australian adult population. Australian Research Centre for Population Oral Health. (2009) Aust Dent J 54: 390–393. 8. Rajkarnikar, J., Acharya, J. Prevalence and severity of periodontal diseases among Nepalese adults - a hospital based study. (2014) Journal of College of Medical Sciences-Nepal 10:11-16. 9. Zahid H, Hytham N, Mohamed F. Prevalence of Periodontal Diseases among Patients Attending the Outpatient Department at the College of Dentistry, King Khalid University, Abha, Saudi Arabia. (2013) City Dent Coll J 10(1): 9-17. 10. Abdel Fattah, A.H., Al-Ghamdi, F.A., Yousef, S.I., et al. Severity and Bidirectional Link between Periodontal Disease and Type 2 Diabetes Mellitus in Saudi Patients. (2015) EC Dental Science 3(2): 464-471. 11. Luzzi, L.I., Greghi, S.L., Passanezi, E., et al. Evaluation of clinical periodontal conditions in smokers and non-smokers. (2007) J Appl Oral Sci 15(6): 512-517. 12. Idrees, M.M., Azzeghaiby, S.N., Hammad, M.M., et al. 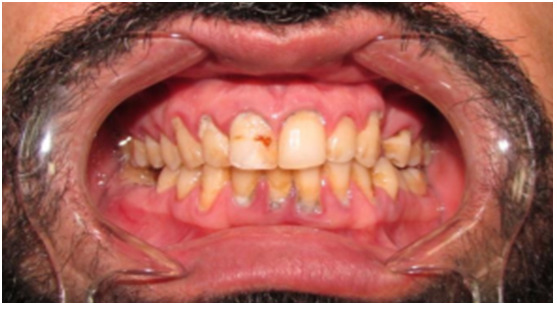 Prevalence and severity of plaque-induced gingivitis in a Saudi adult population. (2014) Saudi Med J 35(11): 1373–1377. 13. O'leary, T.J., Darke, R.B., Naylor,J.E. The plaque control record. (1972) J Periodontol 43(1): 38-46. 14. Ainamo, J., Bay, I. Problems and proposals for recording gingivitis and plaque. (1975) Int Dent J. 25(4):229-235. 15. Ramfjord, S.P., Emslie, R.D., Greene, J.C., et al. Epidemiology studies of periodontal diseases. (1968) Am J Publ health 58: 1713-1722. 16. Mani, A.M., Tejnani, A.H., Pawar, B.R., et al. The Relationship Between Periodontitis and Systemic Diseases – Hype or Hope? (2013) J Clin Diagn Res 7(4): 758–762. 17. Lamster., Lalla, E., Borgnakke, W., et al. The Relationship between Oral Health and Diabetes Mellitus. (2008) J Am Dent Assoc. 139 Suppl: 19S-24S. 18. Awartani, F. Evaluation of the relationship between type 2 diabetes and periodontal disease. (2009) Saudi Med J 30(7): 902-906. 19. Haseeb, M., Khawaja, K,I., Ataullah, K., et al. Periodontal disease in type 2 diabetes mellitus. (2012) J Coll Physicians Surg Pak 22(8): 514-518. 20. Albandar, J.M., Streckfus, C.F., Adesanya, M.R., et al. Cigar, pipe, and cigarette smoking as risk factors for periodontal disease and tooth loss. (2000) J Periodontol 71(12): 1874-8181. 21. Goultschin, J., Cohen, H.D.S., Donchin, M., et al. Association of smoking with periodontal treatment needs. (1990) J Periodontol 61: 364-367. 22. Renvert, S., Dahlén, G., Wikströn, M. The clinical and microbiological effects of non-surgical periodontal therapy in smokers and non-smokers. (1998) J ClinPeriodontol 25: 153-157. 23. Jansson, L.E., Hagström, K.E. Relationship between compliance and periodontal treatment outcome in smokers. (2002) J Periodontol 73(6): 602-607. 24. Karim, A., Ogbeide, D.O., Siddiqui, S., et al. Prevalence of diabetes mellitus in a Saudi community. (2000) Saudi Med J 21(5): 438-442. 25. Bergström, J., Preber, H. The influence of cigarette smoking on the development of experimental gingivitis. (1986) J Periodontal Res 21: 668-676. 26. Lie, M.A., Van der Weijden, G.A., Timmerman, M.F., et al. Oral microbiota in smokers and non-smokers in natural and experimentally-induced gingivitis. (1998) J Clin Periodontol 25: 677-686. 27. Modeer, T., Lavstedt, S., Ahlund, C. Relation between tobacco consumption and oral Health in Swedish schoolchildren. (1980) Acta Odontol Scand 38(4): 223-227. 28. Sheiham, A. Periodontal disease and oral cleanliness in tobacco smokers. (1971) J Periodontol 42(5): 259-263. 29. Saremi, A., et al. Periodontal disease and mortality in type 2 diabetes. (2005) Diabetes Care 28(1): 27-32. 30. Axelsson, P., Paulander, J., Lindhe, J. Relationship between smoking and dental status in 35, 50, 65 and 75 years old individuals. (1998) J ClinPeriodont 25: 297-305. 31. Ah, M.K.B., Johnson, G.K., Kaldahl, W.B., et al. The effect of smoking on the response to periodontal therapy. (1994) J ClinPeriodont 21: 91-97. 32. Grossi, S.G., Genco, R.J. Periodontal Disease and Diabetes Mellitus: A Two-Way Relationship. (1998) Annals of Periodontology 3: 51-61. 33. Torrungruang, K., Tamsailom, S., Rojanasomsith, K., et al. Risk indicators of periodontal disease in older Thai adults. (2005) J Periodontol 76: 558-565. 34. Soory, M. Periodontal disease severity and systemic diseases prevalent in a Caribbean catchment area of patients. (2007) West Indian Med J 56(2): 190-193. 35. Roberts-Thomson, K.F., Do, L.G., Bartold, P.M., et al. Prevalence, extent and severity of severe periodontal destruction in an urban Aboriginal and Torres Strait Islander population. (2014) Aust Dent J 59(1): 43-47.